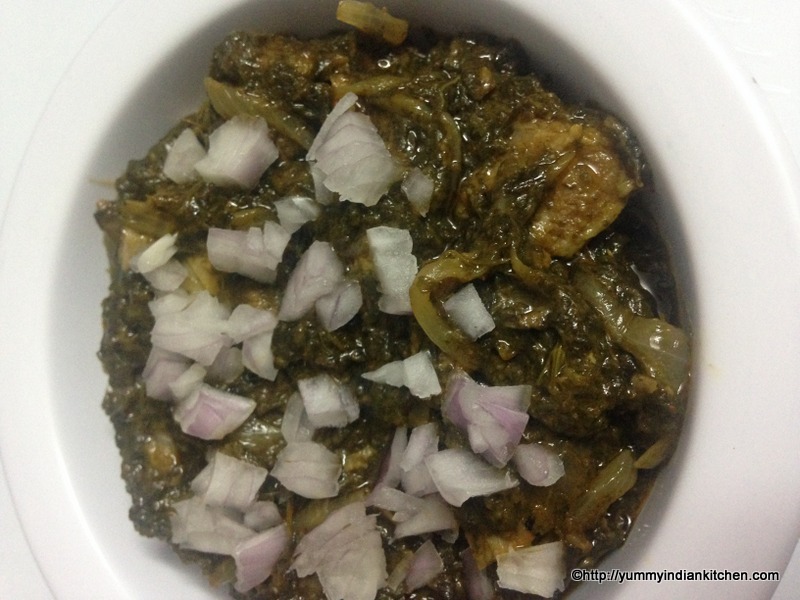 Gongura Mutton recipe is made with ‘gongura leaves’ and mutton. Gongura is a telugu term for ‘sorrel leaves’ in english. Gongura mutton curry is a mouthwatering recipe which is a South Indian Cuisine mainly it hails from the andhra region of Andhra Pradesh. It is like one of the most popular recipes in andhra along with gongura chicken. 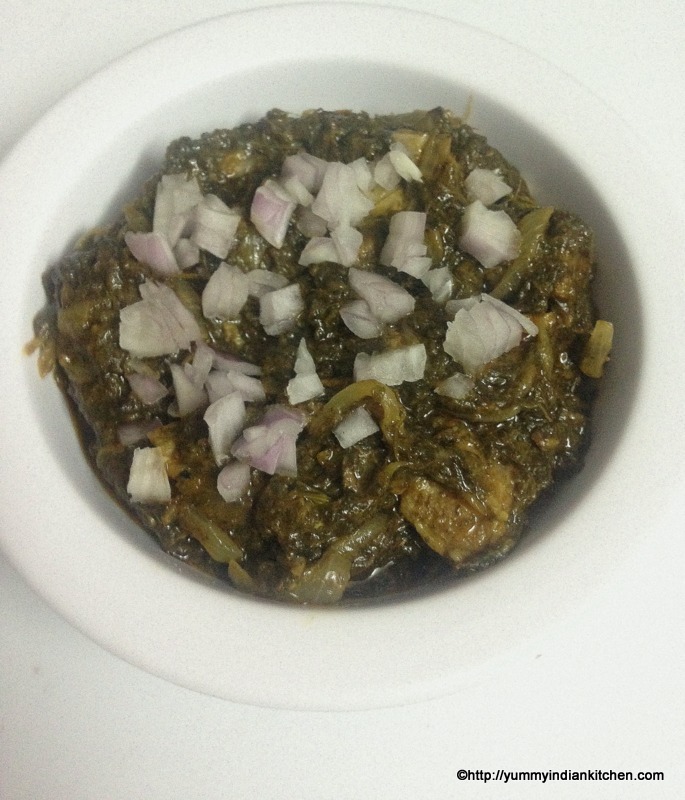 The recipe gives a different and unusual taste to the mutton as the gongura leaves or sorrel leaves have tangy taste. But adding the right amount of gongura or sorrel leaves would lessen the tangy flavor and gives the perfect taste if the ingredients are added in balance. Another tip to reduce the tangy taste is adding red chilli powder while cooking gongura, as doing so helps in reducing the sour taste to a large extent. The main ingredients in this gongura mutton recipe are the leaves and the mutton and the combination of both veg and non veg ingredients should definitely be tried. I have tried this recipe and have been successful many times and it tastes really well with bagara rice or simply plain rice. This combination has never been new since I am a Hyderabadi and we do make gongura mutton often which is called as ‘Ambada Gosht’ in Hyderabadi lingo . I have seen my family members making this dish but when I tried the recipe I was happy with the end result. The dish can also be tasted with roti and can be had for lunch or dinner. This dish is usually served to guests as a special dish in the andhra region of andhra pradesh. Gongura is good to be included in our daily diet as it has got good amount of health benefits, very nutritional and good with lots of Vitamins too. The leaves have a red stem and a green stem and both the varieties are edible but red stem gives a bit sour taste and it is our choice as to which leaves we need to use. Here are the step by step details on making gongura mutton recipe in andhra style or ambada gosht recipe. Firstly, boil or pressure cook the mutton or meat until it gets tender by adding salt, red chilli powder, turmeric powder, ginger garlic paste, water and rest it aside. In a cooking vessel add gongura leaves, add little oil and cook until they are soft. When the leaves gather and become soft, cool it down and make a paste of the leaves and rest it aside. In a separate cooking vessel, add oil and heat it, add chopped onions, slit green chillies and saute till the onions get slight pinkish. Add curry leaves as an optional ingredient. Add the stock of the pressure cooked mutton and cook well until the stock gets absorbed. When the stock is absorbed totally add the cooked mutton and fry it well. Finally, add the gongura paste into the curry, mix and cook for few minutes. Check for salt, red chilli powder and cook for about ten minutes. 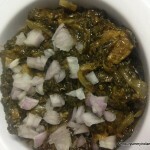 1.If the flavor is too tangy then reduce the amount of sorrel leaves or increase the quantity of onions in the curry the next time you try the dish. 2.One can add red chilli powder while cooking gongura to reduce the sour taste. 3.Also try my gongura chicken recipe. And the same procedure can be applied to gongura mutton too.